APA Group has won a unanimous recommendation from the manager of Hastings Diversified Utilities Fund that HDF security holders accept APA Groups takeover offer. Hastings Funds Management's independent directors have withdrawn their recommendation that security holders accept Pipeline Partners Australias earlier offer after PPA declined to match APA Groups new offer. HDF is now liable to pay PPA a break fee of $12.3 million. HDFs independent director who hold securities will accept APAs offer if a superior offer does not arise. APAs offer is open until 4 September unless extended. APA had a successful 2011-12. Its profit after tax and minorities including significant items was up 20.4 per cent to $130.6 million; although revenue was down 3.8 per cent to $1.06 billion. The company said the strong performance was due to a full year contribution from asset expansions such as the Young Wagga lateral and the Moomba Sydney Pipeline; tariff increases across most assets; increased contributions from Energy Investments which includes Envestra, Hastings Diversified Utilities Fund and GDI (EII); earnings contributions from Emu Downs wind farm and the Amadeus Gas Pipeline; and lower borrowing costs following the sale of Allgas and a reduction in the average interest rate. These gains were offset by reduced annual revenue due to Allgas, and reduced customer contribution from its asset management services. APA will pay a final distribution of 18 cents per security, bringing the full year distribution to 35 cents, up on the 34.4 cents for 2010-11. The payout ratio is 67 per cent of operating cash flow. The 2012-13 distribution guidance is at least equal to 2011-12 and will be unchanged if the HDF takeover proceeds. DUET group subsidiary United Energy (UE) has issued another $65 million under its medium term note program at a fixed coupon of 6.25 per cent per annum and a maturity of April 2017. The proceeds will refinance part of UEs $260 million short term debt facility, which is drawn to $92 million and matures in April 2014. Despite a 2 per cent increase in revenue to $9.03 billion, Sims Metal Management announced a huge loss after tax of $521 million for 2011-12. The statutory loss was due to the non cash goodwill impairment charges accounted for in the first half of 2011-12. The net profit on an underlying basis was $77 million, a decrease of 58 per cent on 2010-11. Underlying earnings per share was 37 cents, down 58 per cent. Earnings (EBITDA) were $253 million, a decrease of 39 per cent on the previous year. The final dividend is 10 cents per share unfranked. Total scrap intake and shipments were 14.4 million tonnes and 14.5 million tonnes respectively. Scrap intake and shipments increased 1 per cent and 2 per cent respectively on the prior year. Group chief executive officer Daniel W. Dienst said The prolonged global economic malaise continues to impact developed and emerging economies, and adversely affected our business during Fiscal 2012. We were impacted most significantly by extreme volatility in both product pricing and demand, decreased commodity prices, diminished supply of feedstock, tepid ferrous trading conditions particularly at the end of the first and second halves, and reduced metal spreads. There were also a number of significant items recorded in Fiscal 2012 including $614 million of non cash goodwill impairment and impairment of goodwill in a joint venture. Despite these tough conditions, we focused on aspects of our business within our control, such as operating costs and capital deployment. We aggressively rationalized our traditional metals business in North America during the second half of Fiscal 2012 and are currently implementing a rationalization plan in the U.K.
Sims completed eleven acquisitions in metals recycling and two in electronics recycling. We also continued to implement technology at our shredding facilities and constructed a significant plastics recycling center in the UK. Our SRS [Sims Recycling Solutions] business accomplished sales of $1 billion for the first time in Fiscal 2012, representing growth of 29 per cent on the prior corresponding period. Envestra increased its net profit for 2011-12 by 64 per cent to $73.9 million. The increase was from the strong revenue growth, up 10 per cent to $468.6 million, plus operating and funding cost control. The revenue growth largely reflected annual tariff adjustments. Operating costs were up 3 per cent due mostly to marketing to increase customer connections and long term gas volume growth. Gearing at 30 June was 64 per cent, down from 68 per cent. Net finance costs fell 2 per cent to $171.2 million despite net debt increasing by $35 million. The volume of gas delivered to residential and small industrial and commercial consumers fell 6 per cent to 50 petajoules, due largely to warmer weather including the 2011 winter. Envestra increased its capital expenditure by 36 per cent to $176.1 million, mostly on network extensions and upgrades, and expects to spend around $230 million on capital works. It laid 260 kilometres of mains, primarily in new subdivisions, and replaced 331 kilometres of old mains. It now has 23,600 kilometres of networks and pipelines and over 1.1 million consumers. The final dividend will be maintained at 2.9 cents and is unfranked. The dividend rate for 2013 will be reviewed after the release of the Australian Energy Regulators decision on the Victorian Access Arrangement. Hastings Diversified Utilities Fund has given a unanimous recommendation that its security holders accept the takeover offer by APA Group. Hastings Funds Management independent directors have withdrawn their recommendation that security holders accept Pipeline Partners Australias earlier offer after PPA declined to match APA Groups new offer. HDF is now liable to pay PPA a break fee of $12.3 million. Tassal Group has doubled its final dividend to 4 cents per share and quadrupled its full year dividend for 2011-12 to 8 cents. The move reflects the companys growing cash flows, strong balance sheet and growth outlook, said directors. However, they expect that dividend payments for 2012-13 will remain unfranked. Tassals statutory net profit after tax was $28.1 million, in line with expectations but down 7.2 per cent on the $30.3 million in 2010-11. Revenue was up 16 per cent to $261.7 million. Although there was weakness in export prices, Australian sales revenue and volume grew by 23 and 25 per cent respectively. Gearing or net debt to equity fell from 31.8 per cent to 25.6 per cent. Managing director and chief executive, Mark Ryan, said Tassals focus on the Australian market has produced growth in revenue in both the retail and wholesale segments over the past twelve months. Our strategy of maximizing per capita consumption of salmon in Australia is clearly producing results, with market penetration levels continuing to improve. However, the performance in the domestic market was impacted by a volatile export market performance due to global oversupply of salmon reducing prices. With export returns not expected to improve over the short to medium term, this reaffirms our focus on Australian market growth. Tassals investment in infrastructure has produced world class hatching, growing and processing facilities, together with providing appropriate risk mitigation measures against agricultural risk. This has allowed us to sustainably grow harvest tonnes over the past 12 months through a combination of larger fish and greater harvest numbers, ensuring supply as we continue to grow in the Australian market, he said. Tox Free Solutions had a successful 2011-12 with net profit rising 31 per cent to $17.2 million, and earnings per share rising 15 per cent to 16.3 cents. Revenue was up 45 per cent to $207.9 million. The company said the integration and earnings from the DoloMatrix businesses it acquired during the year are on plan. Net debt to equity is 30 per cent. The final dividend was increased to 4 cents per share fully franked, up from 3 cents. Tox Free expects continued growth in the solid waste sector as it expands its services into new geographic areas of Australia. Gale Pacific increased its net profit by 20 per cent in 2011-12 to a record $8.5 million. Revenue rose 16 per cent to $110.5 million. It includes full year contributions from the Zone Hardware and Riva Window Fashions businesses. The rise was despite the impact of unfavourable foreign currency movements due to the strong Australian dollar. Sales revenues in local currencies grew by 10 per cent in the US and 27 per cent in the Middle East. Other international market sales were up 104 per cent to $10.4 million driven by increases in Japan, South Africa and Europe. But sales were lower in Australia due to weak consumer demand, competition, the strong dollar which lead to price deflation, and a poor summer in most parts of the country. Sales were down by 13 per cent in New Zealand due to weak consumer demand and a poor agricultural season. The final dividend is up slightly to 1.25 cents per share fully franked. The full year dividend is 2.45 cents per share on diluted earnings of 2.86 cents per share. This is an 11 per cent increase on 2010-11. Gale Pacific said it expects trading conditions to remain challenging with consumer and business confidence levels low in most markets. Retail conditions in Australia are difficult, but it expects good conditions in the agricultural market for the coming season and there are predictions of a return to more normal summer weather. Further sales expansion of Coolaroo, Zone, Riva and Synthesis branded products is expected to deliver another solid financial result in 2012-13 in what is expected to be a volatile global market environment, said managing director and chief executive officer, Peter McDonald. Gerard Lighting Group achieved revenue of $389 million and a net profit after tax of $17.6 million for 2011-12. The profit is down $1.9 million compared to 2010-11, and revenue of $389.3 million was down 3.7 per cent. Managing director, Simon Gerard said Over the past twelve months, the Australian lighting market has been impacted by a downturn in residential building consents and continued soft levels of approval for commercial and retail construction. Further, our ability to expand margins was impacted by a competitive landscape influenced by the strong Australian dollar, resulting in increased price competition from our competitors who import the majority of their product. Medical waste manager SteriHealth reported a 6.6 per cent rise in net profit for 2011-12 to $4.03 million. Revenue from continuing operations was up 63 per cent to $52.5 million. The growth was almost entirely organic, with the biggest increase from Daniels Sharpsmart and the extension of the underlying technology into Clinismart services. While these service lines have achieved double digit growth, SteriHealth retained or improved its market share in the private and public hospital clinical waste market despite ongoing regional margin pressures, said the company. In the year to 30 June, the Climate Advocacy Fund managed by Australian Ethical Investment made a return of minus 4.9 per cent compared to the S&P/ASX 200 Index of minus 6.7 per cent. Since inception the index fund has returned minus 0.4 per cent per annum compared to minus 0.9 per cent for the Index. Qube Logistics recorded a net loss of $2.5 million for 2011-12 against a profit in 2010-11 of $61.8 million. However the results are not directly comparable as Qube restructured from a trust to a company, incurred large restructuring costs of $42.7 million, and made significant acquisitions. Revenue from external customers rose to $781.7 million from $278.6 million. The fully franked final dividend rose to 2.1 cents per share from 1.9 cents. The company said it had record financial results across both operating divisions, Ports & Bulk Division and Logistics Division. These are very strong results which have been achieved despite a sometimes difficult external environment. Both operating divisions have performed well overcoming the impacts of a difficult domestic retail environment and an uncertain global economic outlook. In 2012-13, Qube will focus on consolidating and extracting synergies from its recent acquisitions, and invest further in facilities and equipment. Through organic growth and the full year contribution from acquisitions and investments it expects to deliver underlying revenue and earnings growth but at a lower growth rate than 2011-12. Transpacific Industries Group made a statutory profit after tax of $12.5 million for the year to 30 June 2012, compared with a loss of $296.5 million for the previous year. Directors said that if some items are excluded, the underlying result a more closely aligned with ongoing operations shows a profit after tax of $58 million, a 33 per cent increase over 2010-11. These adjustments include settlement and legal costs associated with shareholder actions of $37.9 million, restructuring and redundancy costs of $11.5 million, and the net gain on disposal of investments and properties of $7.4 million. Group revenue was up 4.8 per cent to $2.28 billion. The Australian resources and oil and gas markets generated growth however this was largely offset by lower demand from the Australian manufacturing sector, lower activity in the metropolitan markets of Melbourne, Adelaide and Perth and reduced emergency response work, said the company. The Waste Management businesses grew revenue by 2.2 per cent, and the Commercial Vehicles division by 21 per cent. However, revenue from the Manufacturing division fell 20.5 per cent and the division is likely to be sold. The improvement plans instigated last year within the Manufacturing division have shown positive results as the losses recorded in FY11 were greatly reduced. Negotiations are underway with several prospective purchasers of the Manufacturing businesses and the Company is targeting to complete divestments during the current financial year, said the company. Also important, gross debt was reduced by $378 million to $1.13 billion. To help reduce debt further, there will again be no dividend. Shares in Energy Action rose to an all time high of $2.09 when the energy management company reported a strong profit for 2011-12. Net profit was $3.6 million, an annual increase of 23 per cent. Revenue was $17.4 million, up 24 per cent. Energy Action said its solid results were driven by a continuing trend among businesses to outsource their energy procurement and management functions. The company ran over 2,400 auction scenarios on its Australian Energy Exchange in 2011-12. Energy Action has over 8,000 sites under active or future energy contracts. It procured $720 million in energy contracts in the year, bringing the total amount it has procured since 2006 to $3.5 billion. Earnings per share were 15.13 cents, up 8 per cent. The final dividend is 3.72 cents per share fully franked, bringing the 2012 dividend to 7.2 cents per share. Energy Action said it finished the year with a robust cash position and no debt, giving it financial flexibility to pursue growth opportunities. It is expanding its geographical footprint by establishing a sales office in WA, which is a key growth market. Energy Developments reported a net profit after tax and specific items of $9.3 million for the year to 30 June 2012, up $38.1 million over the prior year. Specific items of $19.1 million after tax included impairment charges of $18.8 million against green credit inventory in Australia from the cessation of the NSW GGAS scheme on 1 July 2012, and acquisition and integration costs of $6 million after tax. Revenue grew to $311 million from $249.3 million. Managing director Greg Pritchard said We anticipate the company will continue its growth momentum with a full year contribution during 2013 from projects just completed, and the significant pipeline of committed projects currently underway. ENE enjoys long standing relationships with blue chip counterparties. We have a current pipeline of projects under construction which will add another 28 MW of generation capacity, a further 67 MW of projects committed, and a solid funding position. The company is well placed for continued growth. he said. In Australia, the regulatory environment for existing Waste Coal Mine Gas (WCMG) power stations remains positive. It includes ENE's German Creek and Moranbah North power stations as a capped addition to the Renewable Energy Target (RET) until 31 December 2020. This recognizes the valuable contribution of these power stations to clean energy generation and the abatement of greenhouse gas, he said. However the news is not as positive on the Carbon Farming Initiative (CFI) front. In April the company welcomed the passage of the CFI legislation and expected all of its landfill gas (LFG) projects would be eligible to obtain accreditation under the program. Category A projects comprise 40 per cent of the landfill gas abatement projects in Australia, including 49 MW of ENE's LFG portfolio. These are some of the oldest and largest abatement projects in Australia and abate 1 million tonnes of CO2 equivalent emissions per year. The 11 MW Clayton landfill gas power project in Victoria is one such project excluded under the recent determination, even though it was the venue selected by the Government to announce passage of the CFI Legislation last December, said Mr Pritchard. The company is implementing an on market buy back for up to $5 million of its capital over 12 months. This is so it can repurchase shares on an opportunistic basis, particularly in times of market or share price volatility. However, the companys largest shareholder, Greenspark Power Holdings Limited which currently owns 80 per cent of the company, does not intend to participate in the buy back. ERM Power more than doubled its statutory net profit for 2011-12 to $34.2 million, a 111 per cent increase on the $16.2 million in 2010-11. Revenue rose 71 per cent to $937.9 million. The underlying net profit was $30.3 million and the underlying earnings per share were 18.4 cents. It has forecast underlying net profit for 2012-13 of between $22 million and $26 million. Factors in the result were strong growth in electricity sales, a gain from the acquisition of a controlling interest in the Oakey power station in Queensland and consolidation of Oakeys contribution. The fully franked final dividend is 4.5 cents per share, up from 3.5 cents. The full year dividend is 8.5 cents compared to 3.5 cents the previous year. Managing director and CEO Philip St Baker said ERM Power performed strongly in financial and operational terms to exceed prospectus forecasts for revenue despite challenging conditions including floods and industrial action which affected customer consumption and weaker electricity demand forecasts which affected generation development. A major driver of the result was our electricity sales business, Mr St Baker said. We expect high growth rates to continue for many years as we consolidate our position in the large commercial and industrial customer segment across Australia and then go deeper into the market by expanding into the Small to Medium Enterprise (SME) customer segment in 2013. August Investments has topped up its holding in Energy Action at $1.95 per share. The company continues to impress, it said with profit up 6 per cent and cash flow up 43 per cent. The Australian Ethical Smaller Companies Trust returned minus 4.2 per cent for the year to 30 June. Its benchmark S&P/ASX Small Industrials Index returned minus 2.7 per cent. The Fund has returned 8.4 per cent per annum since inception. 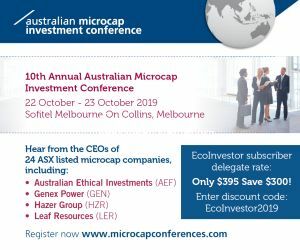 The Australian Ethical International Equities Trust made a one year return of minus 18.1 per cent to 30 June, compared to 0 per cent for the MSCI World Index and minus 40.3 per cent for the Wilderhill New Energy Index. The Funds return since inception is minus 11.6 per cent per annum. Cardia Bioplastics has won a $500,000 per annum supply contract with a global consumer products company to provide Cardia Compostable bags as part of its consumer product offering. The new consumer product is expected to go to market in November. The Cardia Compostable bags will be used in conjunction with a specific product line to encourage environmentally friendly waste disposal practices. The relationship has the potential to expand into other product channels, and provides Cardia with exposure to the clients extensive retail channels. Pacific Energy reported a 153 per cent turnaround in net profit for 2011-12 to $1.1 million against a loss of $2.1 million in 2010-11. Revenue was $31.9 million, an annual increase of 19 per cent. Earnings (EBITDA) from its Kalgoorlie Power Systems (KPS) and hydro electric businesses rose 23 per cent to $21.5 million, a record. Managing director Adam Boyd said Pacific Energy has delivered excellent organic earnings growth, resulting in another record result for the period. This was largely due to the exceptional performance of the Kalgoorlie Power Systems business which has secured new contract capacity of approximately 100 MW since 1 July 2011. This result confirms the growing reputation of KPS as the most reliable, fuel efficient and cost competitive electricity supplier to the Australian resources sector and will underpin further record earnings results in both the 2013 and 2014 financial years. KPS is now moving to construct and commission 92 MW of new generation capacity at nine power stations in 2012-13. The construction and retro fit of waste heat recovery systems across 20 MW of the power fleet is well advanced and will deliver a significant reduction in fuel consumption by KPS power stations at Regis Resources gold processing operations. In poor news, Dart Energy is facing a blockade and legal challenge by locals to its plan to drill coal seam gas wells near Newcastle. The Sydney Morning Herald has reported that residents from Fullerton Cove are blockading a Dart Energy coal seam gas test drilling site. The Energy Minister, Chris Hartcher, said police were going to move in to stop protesters preventing drilling taking place. Five people were issued with fines, but about 50 people were still at the site stopping drilling activities. Dart Energy intends to drill four wells there, wrote the Herald. Eden Energy is undertaking a non renounceable pro rata rights offer to raise up to $2,956,572. The one for one offer is at 0.9 cents per share and closes on 28 September. The offer is partially underwritten by RM Corporate Finance Pty Ltd to $1.5 million and subunderwritten to $1.5 million by Noble Energy Pty Ltd, Eden's largest shareholder. Hythane Company, Eden Energys US subsidiary, has seen US OptiBlend sales exceed quarterly projections due to new and repeat orders. Hythane Company recently received an order for six OptiBlend units from a new customer for landbased shale gas drilling and hydraulic fracking operations. Follow up orders are anticipated once the initial units are installed. Eden said a typical hydraulic fracking site has 4 to 12 pumping units, and each requires one OptiBlend unit per pumping unit. Given the thousands of operational and yet to be-deployed rigs and fracking pumps in the US shale gas exploration market, Hythane Company is only starting to realize its potential with OptiBlend sales, said Eden chairman, Gregory Solomon. Hythane Company is well positioned compared with its competition to take advantage of this market due to the reported superior performance of the OptiBlend units compared to the other dual fuel systems, he said. Based on feedback from multiple oilfield and drilling customers, the OptiBlend system out performs competitors dual fuel systems with faster engine response times. Engine performance is crucial in the oilfields because of the large variances in load demand, and the importance of continuous drilling and pumping. Geodynamics partner and shareholder Origin Energy has completed the writedown of the carrying value of its share of their joint ventures. It has 30 per cent of the Deeps project, 50 per cent of the Shallows project and 100 per cent of GEL 185. These were fully impaired at 30 June 2012 with a gross cost of $44 million and an after tax net cost of $33 million. Origin said the joint venture activities have not met expectations for a timely and commercial development of the geothermal resources. Kimberley Rare Earths said a concept study for the Cummins Range Project in WA confirms that the project is technically viable. The Cummins Range rare earths deposit has significant advantages of favorable mineralogy, ease of mining, and relatively low technical and country risk. The base case concept is for straightforward open pit mining and concentration at the site; then downstream processing into five separate rare earth products at a coastal port such as Broome, Derby, Wyndham or Darwin, The principal market is Asia. A 16 year mine life is possible at a production rate of 3,000 tonnes per annum total rare earth oxide (TREO). Orocobre has purchased the long established Argentine boron minerals and refined chemicals producer, Borax Argentina S.A., from Rio Tinto PLC. The business has annual revenue of US$23 million and annual production of 35,000 tonnes of boron based products and mineral concentrates. Borax Argentina operates three open pit mines in Tincalayu, Sijes, and Porvenir, concentration plants in Tincalayu, Sijes and Porvenir (currently unused), and refinery facilities in Campo Quijano. Deposits at Diablillos and Ratones are undeveloped. The refinery produces a variety of boron chemical products including boric acid, borax decahydrate, borax pentahydrate, anhydrous borax and boroglas from concentrates and ulexite minerals from the mines and concentrators. The mine and concentrator at Sijes produce mineral concentrates for direct sale. Orocobre said Borax Argentina owns one of only a few important borate deposits globally that are in production. The purchase of Borax Argentina provides an opportunity to acquire this significant quantity of historically estimated boron mineralization at an attractive valuation, it said. Boron compounds are used in hundreds of applications such as insulation; agricultural nutrients; high tech glass products and coatings in computers, LEDs, plasma screens, circuit boards and solar panels; flame retardant properties in textiles; enhanced efficiency in industrial manufacturing processes; and fungicides and insecticides. Boron minerals and chemicals production complements Orocobres core lithium developments with synergies in potential future boron chemicals production from brines at Olaroz and elsewhere, it said. Borax Argentina also owns the tenure on all or parts of the lithium projects being progressed by other lithium exploration companies, including Lithium Americas Corporation Ltd (TSX:LAC) at Salar de Cauchari, Rodinia Lithium Ltd (TSX V: RM) at Diablillos, and Galaxy Resources Ltd (ASX: GXY) at Sal de Vida (formerly Lithium Ones project). As one of the conditions to extract brines, these companies are required to make payments to Borax Argentina either as fixed annual payments or a royalty related to production. The acquisition of Borax Argentina is a logical fit with Orocobres salar based industrial mineral strategy and primary focus on lithium production. Boric acid is a potentially valuable product to be extracted from brines such as the lithium potash boron brines at the Olaroz and Cauchari projects. Borax Argentinas experience as a producer and marketer of boric acid will serve to augment operational and commercial insight related to potential future volumes of boric acid from the Companys brine projects. Although Borax Argentina is currently only a relatively small and marginally profitable producer, it is asset rich in terms of mines, plant and human resources and has potential to materially improve performance based on processing recovery improvements and plant utilization, said Orocobre. The consideration for the purchase is US$8.5 million, of which US$5.5 million has been paid and US$1 million will be paid annually over three years. The consideration comprises US$3.7 million for all of the shares of Borax Argentina and US$4.8 million to Borax Europe Ltd, a Rio Tinto PLC company as consideration for the assignment of a loan made by it to Borax Argentina. Ocean Power Technologies subsidiary, Reedsport OPT Wave Park, LLC, has received approval from the US Federal Energy Regulatory Commission (FERC) for the full build out of its planned 1.5 megawatt grid connected wave power station off Reedsport, Oregon. The company said this is the first FERC license for a wave power station issued in the United States and is an important regulatory approval for the deployment of up to 10 OPT devices generating enough electricity for about 1,000 homes. Construction of the initial PowerBuoy is near completion and should be ready for deployment about 2.5 miles off the Reedsport coast later this year. OPT has received funding for the first system from the US Department of Energy, with the support of the Oregon Congressional delegation, and from PNGC Power, an Oregon based electric power cooperative. The FERC has granted a 35 year license for grid connected, wave energy production. This follows extensive environment assessment, notifications to the public, assessment of Federal and State regulations, and consideration of an array of comments, recommendations and terms and conditions.